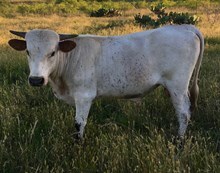 This gorgeous young gal was camped out at Fiebrich Longhorns for a season a few years back and we fell in love with her sweet disposition, flashy color and incredible horn development so we had to bring her into the fold. Was probably meant to be since her name had "Wine" in it....Thank you Matt and Jackie Tucker for selling us this beautiful animal. 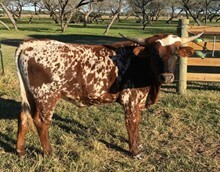 She's line bred Gunman and out of a PCC Evader son with Evader's trademark confetti speckles and twisty rolling horns. 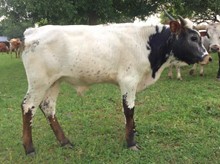 Raises big, correct calves with lots of twisty horn. We have very high hopes for this young gal.